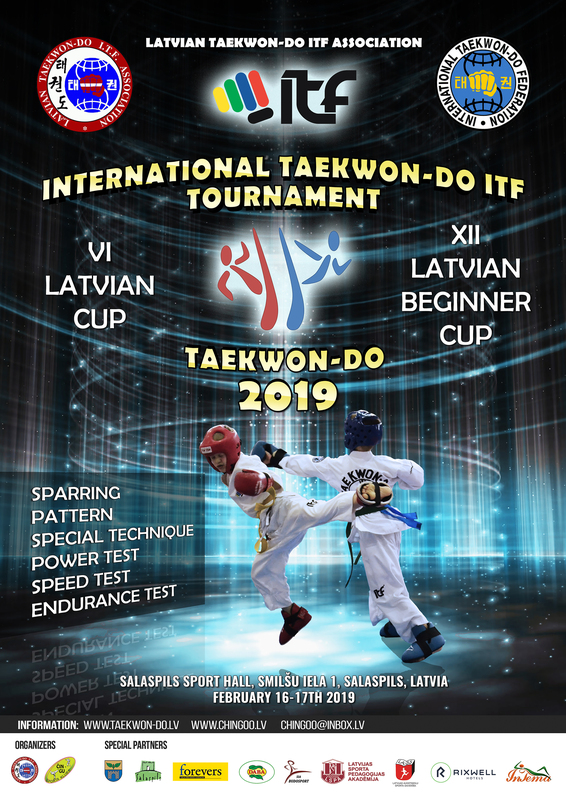 It is my great pleasure to invite you to the International Taekwon-do ITF Tournament VI LATVIAN TAEKWON-DO ITF CUP 2019 & XII LATVIAN TAEKWON-DO ITF BEGINNER CUP 2019 to be held in Salaspils Sport hall, Salaspils (20 km from Riga), Latvia on February 16-17, 2019. The main organizers of the event is the Latvian Taekwon-Do ITF Association in cooperation with Sport Club „Chin-Goo”. The program of competition consist of individual sparring, pattern, special techniques, power test, pre arranged free sparring, kick speed- and endurance test. Last year our tournament was attended by by 24 club 422 athletes from 8 countries – ENGLAND (Pantera, United Kindom), BELORUSSIA (Kaskad, Sparta and BPAT from Minsk and Vitebsk), KAZAKHSTAN (Berkut from Almaty), RUSSIA (St. Petersburg, Velikie Luki, Kingisepp and Viborg), POLAND (Matsogi Ciechanow, Lotos Jabłonna, Combat Sports Academy), UKRAINE (Kychko Team and Maks Sport from Kiev), UZBEKISTAN (Taekwon-do ITF federation) and LATVIA (AlexClub, Čin-Gu, TKD, Tan-Gun, Līvāni, Viktorija-T, Zeta Sports, LTCS un Sonkal), who fought on seven tatami floors – 6 for pattern and sparring, 1 for special technique, speed test and endurance test. Each year tournament was attended more and more participants and clubs from any countries! 20th January 2019 – deadline for all reservations of accommodation to chingoo@inbox.lv. 10th February 2019 – publication of draws online. 15th February 2019 – registration, weight control and coach meeting. 16-17th February 2019 – competition. Looking forward to meeting all of you in Latvia in February 2019.